Pregnancy is indeed amazing, but for totally different reasons than most women talk about. 1. If you’ve spent your whole life trying to hide your less than flat stomach (as I have), suddenly you are totally comfortable having it on full display. 2. When making restaurant/take-out/dinner decisions with a group of friends/coworkers/relatives, everybody always defers to you to make the final call. 3. You can use “I’m not feeling up to it” to get out of pretty much anything—household chores, visiting friends all the way across town, bedtime routine with your toddler, etc. 5. If an old person gets on the bus/train/subway, you don’t have to be the one to give up your seat. 6. You can alternate between the same two outfits for three months and nobody bats an eye. 9. Nobody ever expects you to carry anything. 10. You may look and feel like a whale, but it’s a whale with AMAZING HAIR. 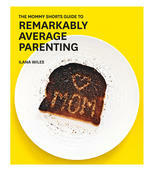 Excerpted from The Mommy Shorts Guide to Remarkably Average Parenting by Ilana Wiles.